Description: This woody plant is a shrub or small tree up to 30' tall that branches occasionally. The upper stems (or branchlets) are covered with dense brown hairs, while the lower stems (trunk or branches) are brown, hairless, and woody. The short trunk is up to 9" across in diameter. The alternate compound leaves are up to 2' long (if not longer); they are oddly pinnate, consisting of 9-31 leaflets. 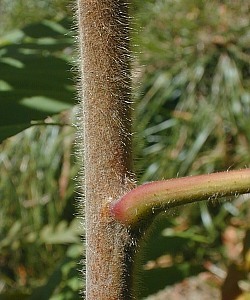 The petioles and central stalks of these compound leaves have scattered brown hairs; the central stalks are often tinted red. The leaflets are up to 5" long and 1" across; they are oblong-lanceolate and serrated along the margins. The upper surface of each leaf is shiny and dark green (becoming red or burgundy during the fall), while the lower surface is pale white. Each leaflet is nearly sessile at the base, and tapers gradually to an elongated tip. Some of the upper stems terminate in individual panicles of greenish yellow flowers up to 1' long and ½' across. Each flower is about ¼" across, consisting of 5 spreading petals, a calyx with 5 lobes, 5 stamens, and a central pistil. Usually, the flowers of Staghorn Sumac are perfect (they have both stamens & pistils), although a few plants produce unisexual flowers only (either all staminate flowers or all pistillate flowers). The blooming period occurs during early to mid-summer and lasts about 2-3 weeks. Each flower is replaced by a globoid drupe about 1/6" (4 mm.) long, which is densely covered with bright red hairs. This drupe contains a single seed with a hard coating. The drupes mature during the fall and persist through the winter; if not eaten, they eventually become dark brown. The root system is woody and can produce vegetative clones from long runners. This plant occasionally forms colonies. Cultivation: The preference is full to partial sun, mesic to dry conditions, and a loam, clay-loam, or rocky soil. This woody plant can spread aggressively by means of underground runners, although the new clonal shoots are intolerant of regular mowing. Range & Habitat: Staghorn Sumac occurs occasionally in the northern half of Illinois, while it is uncommon in the southern half of the state (see Distribution Map). This species is native to the northern half of Illinois, otherwise it is adventive. Habitats include open upland woodlands, woodland borders, thickets, rocky barrens with sparse woody vegetation, dry riverbanks, and areas along railroads. Like other Rhus spp. (Sumacs), this species thrives on moderate levels of disturbance. It can invade prairies or meadows, but declines in the presence of tall canopy trees. 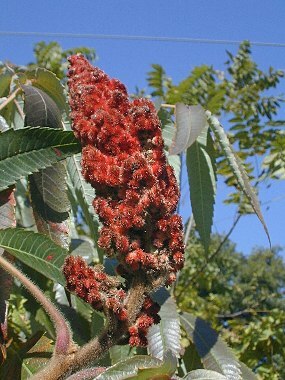 Staghorn Sumac has been grown as an ornamental shrub or small tree in residential areas, although this is fairly uncommon. Faunal Associations: Mostly short-tongued bees, wasps, and flies visit the flowers for nectar or pollen. Little carpenter Bees (Ceratina spp.) create tunnel nests in the pith of Rhus spp. (Sumacs), causing little damage. Various insects and their larvae feed on Sumacs, including Blepharida rhois (Sumac Flea Beetle) and Poecilocapsus lineatus (Four-Lined Plant Bug). The caterpillars of many species of moths are known to feed on the foliage and others parts of Staghorn Sumac and other Sumacs (see Moth Table). Also, the caterpillars of two butterflies species, Calycopis cecrops (Red-Banded Hairstreak) and Celastrina argiolus (Spring/Summer Azure), feed on Sumacs. The fruits of Sumacs are eaten occasionally by upland gamebirds and migrating songbirds during the autumn and winter (see Bird Table). These fruits are regarded primarily as emergency food by birds and will be eaten only when little else is available. The foliage, branches, and twigs of Sumacs are often browsed by the Cottontail Rabbit and White-Tailed Deer; the woody material is particularly important as a source of food during the winter. In general, the ecological value of Sumacs to wildlife is fairly high. Photographic Location: A gravelly area along a railroad in Urbana, Illinois. Comments: This is the tallest Sumac species in Illinois. 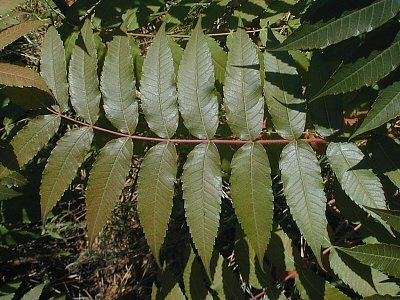 It is less common than Rhus glabra (Smooth Sumac). Staghorn Sumac is easy to identify in the field because its young branches are covered with dense brown hairs. These hairs have the appearance of "velvet" on a deer's antlers, hence the common name. Other Sumacs have young branches that are less hairy or hairless (usually the latter). Like Smooth Sumac, Staghorn Sumac has central leaf stalks without wings, and both Sumacs have leaflets that are serrated along the margins and pale white on their undersides. However, the central leaf stalks of Staghorn Sumac have scattered brown hairs and its bright red drupes are much hairier than those of Smooth Sumac. Another scientific name of Staghorn Sumac is Rhus typhina.